Ocean Spray and the cranberry industry are pumping up their efforts to get cranberry drinks exempted from a potential ban on sugar-added beverages in school venues like vending machines and snack bars. Proposed new U.S. Department of Agriculture regulations governing what beverages and snacks can be sold in schools outside of meal programs are now due out next spring. If they are consistent with the USDA’s rules for National School Lunch and Breakfast program meals rules -- implemented in January under the “Healthy, Hunger-Free Kids Act”-- sugar-added fruit drinks would fall under the sugary drinks prohibited. The meals rules allow only 100%-juice fruit beverages, although many juices, of course, contain natural fruit sugar. Ocean Spray makes a variety of no-sugar-added (its 100% Juice line) and sucralose-sweetened (its Light and Diet Juice Drinks lines) products. However, many of its (and other makers’) cranberry products, such as cranberry juice cocktail, contain added sugar to offset the tart taste of the naturally-low-in-sugar berry. Sugar grams (4 grams equal about one teaspoon sugar) and calorie counts for 8-ounce servings of some of Ocean Spray’s products, according to the brand’s site: Cranberry Juice Cocktail: 30 grams sugars , 120 calories; 100% Juice Cranberry: 36 grams, 140 calories; Light Cranberry Juice Drink: 11 grams, 50 calories; 100% Juice White or Ruby Red Grapefruit, both 17 grams, 90 calories. A typical 8-ounce glass of 100% (non-sweetened) orange juice contains 21 grams of sugars and 110 calories, and a typical 8-ounce serving of a regular cola soft drink has about 27 grams of sugar and about 110 calories (no vitamins or other nutrients). Ocean Spray and the cranberry industry say that the industry will be damaged if the USDA “lumps” their drinks in with other sugar-added beverages -- as much or more by the broader perceptions created as by lost school sales. "We obviously would want to be on the list of things USDA and other agencies buy," Ocean Spray CEO Randy Papadellis told USA Today in June, but “our concern is more the signal a standard that says cranberries are unhealthy sends out to other constituencies. Many people take their cue from USDA in terms of what is healthy." Also not lost on the cranberry industry, of course, is the growing number of state and local policy makers implementing, or considering, taxes or restrictions on sodas and in some cases other sugar-sweetened beverages. An Ocean Spray-spearheaded policy campaign has been arguing that the nutritional value and health benefits associated with juice beverages made with “The Exceptional Cranberry” should differentiate them from other sugar-added drinks. “While efforts to reduce the consumption of sugar are commendable, the unintended result has been the lumping of cranberry juice with beverages that offer little or no nutritional value,” reads the messaging accompanying the link to the petition. 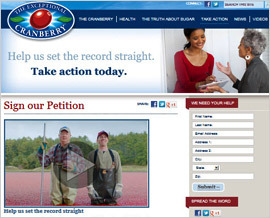 Now, Ocean Spray has created a two-and-half-minute video, featured on the Cranberry Health site and YouTube, showing Papadellis enlisting the “cranberry grower” duo from its advertising to help convey its “exception” messages and urge consumers to sign the petition. The video starts with Papadellis noting that consumers may lately have been getting "mixed messages about the place of cranberries in a healthy diet, particularly with all the noise about added sugar in beverages like cranberry juice." The site also encourages visitors to “continue the conversation” online on “cranberry-health”-branded Faceboo k and Twitter pages. In addition, the brand is driving awareness of the video and petition campaign through Ocean Spray-branded social media assets. Meanwhile, some experts question the validity of asking for an exception for cranberry drinks. “All juices have antioxidants and vitamins. The research shows none do anything special,” Marion Nestle, nutrition, food studies and public health professor at New York University, told Bloomberg Businessweek. "There's some evidence to show that cranberry juice can prevent urinary tract infections, but that doesn't mean everyone should be drinking cranberry juice every day," Margo Wootan, director of nutrition policy for the Center for Science in the Public Interest, told USA Today. "Only 3% of kids a year have urinary tract infections, compared to one-third who are overweight.” Wootan added: "There's no evidence of any particular public health problem to suggest that cranberry drinks should get a special exemption. It's curious that the cranberry industry is pressing Congress for nutrient standards that are weaker than what Coke and Pepsi have already agreed to." Massachusetts-headquartered Ocean Spray -- a cooperative of more than 700 cranberry growers in North America, plus grapefruit growers -- is North America's leading producer of canned and bottled juices and juice drinks, and has been the best-selling brand name in the canned and bottled juice category since 1981. Ocean Spray posted fiscal 2011 gross sales of over $2 billion and net proceeds of $321 million.